Check whether the following symptoms are present. Cannot refuel/Fuel odor from the fuel filler opening is strong while refueling. Are any symptoms present? YES >> Proceed to EC-468, "Diagnosis Procedure". A: Fuel odor from EVAP canister is strong. B: Cannot refuel/Fuel odor from the fuel filler opening is strong while refueling. Remove EVAP canister with EVAP canister vent control valve and EVAP control system pressure sensor attached. Refer to FL-15, "Removal and Installation". Weigh the EVAP canister with EVAP canister vent control valve and EVAP control system pressure sensor attached. Check if water will drain from EVAP canister Does water drain from the EVAP canister? YES >> GO TO 4. Replace EVAP canister with a new one. Refer to FL-15, "Removal and Installation". Check the EVAP hose between EVAP canister and vehicle frame for clogging or poor connection. >> Repair or replace EVAP hose. Refer to FL-15, "Removal and Installation". Check refueling EVAP vapor cut valve. Refer to EC-470, "Component Inspection". Does water drain from the EVAP canister? YES >> GO TO 6. >> Repair or replace EVAP hose. Refer to FL-14, "Exploded View". Check hoses and tubes between EVAP canister and refueling control valve for clogging, kinks, looseness and improper connection. Check recirculation line for clogging, dents and cracks. NO >> Replace filler neck tube. Check filler neck tube and hose connected to the fuel tank for clogging, dents and cracks. NO >> Replace fuel filler tube. Refer to FL-10, "Exploded View". Check one-way valve for clogging. 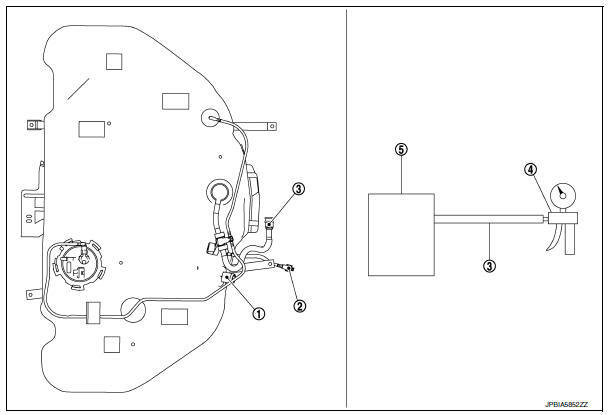 NO >> Repair or replace one-way fuel valve with fuel tank. Refer to FL-10, "Removal and Installation". Check that fuel is drained from the tank. Remove fuel filler tube and hose. Refer to FL-10, "Exploded View". Check one-way fuel valve for operation as per the following. When a stick is inserted, the valve should open, when removing stick it should close. Do not drop any material into the tank. 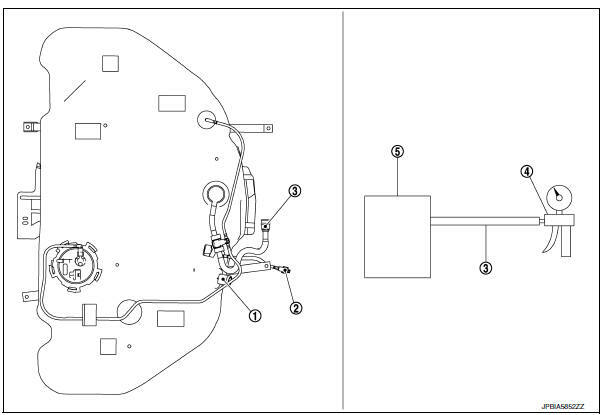 NO >> Replace fuel filler tube or replace one-way fuel valve with fuel tank. Refer to FL-10, "Removal and Installation". Will CONSULT be used? Will CONSULT be used? YES >> GO TO 2. Remove fuel tank. Refer to FL-10, "Removal and Installation". Remove fuel feed hose located on the fuel gauge retainer. Connect a spare fuel hose, one side to fuel gauge retainer where the hose was removed and the other side to a fuel container. Drain fuel using вЂњFUEL PUMP RELAYвЂќ in вЂњACTIVE TESTвЂќ mode with CONSULT. Check refueling EVAP vapor cut valve for being stuck to close as per the following. Blow air into the refueling EVAP vapor cut valve (from the end of EVAP/ORVR line hose), and check that the air flows freely into the tank. Check refueling EVAP vapor cut valve for being stuck to open as per the following. Connect vacuum pump to hose end. Remove fuel gauge retainer with fuel gauge unit. Always replace O-ring with new one. Turn fuel tank upside down. Apply vacuum pressure to hose end [−13.3 kPa (−0.136 kg/cm3, −1.93 psi)] with fuel gauge retainer remaining open and check that the pressure is applicable. Drain fuel from the tank using a handy pump into a fuel container.